Mari Takayanagi, joint project manager and co-curator for Vote 100, saw an advance screening of ‘Suffragette’ and reviews it exclusively for UK Vote 100. ‘Suffragette’ is the story of Maud Watts (Carey Mulligan), a laundry worker in London’s East End, who gets sucked into the suffrage movement almost by accident and becomes one of its most militant campaigners. I found the story gripping, moving, sad and inspiring in turn. Maud’s work in the laundry is endless, grinding, exhausting and dangerous. Yet somehow none of this is as bad as the realisation, which gradually dawns on her and us throughout the film, of the powerlessness of the female workers there. They have little autonomy and few options; they are at the mercy of a mean and predatory boss with no means of redress against him. Outside the laundry, the police brutality is visceral and distressing to watch; the state surveillance which surreptitiously picks up Maud before she even joins the movement is spooky and sinister; the forcible feeding rightly portrayed as torture with all its horrors. But even all this is overshadowed by the appalling strains that Maud’s suffragette activity places on her family life: the ostracisation by neighbours, the lack of support from her uncomprehending husband, and worst of all, time away from her beloved son. By contrast, the suffrage activity gives Maud some degree of agency and control in her life. Watching the film, I could much better understand how appealing and exciting the camaraderie must have been, and also simply the sense of purpose it must have given women with so little power in any other sphere. Along the way she meets other suffragettes from different backgrounds, including Edith Ellyn (Helena Bonham-Carter), a pharmacist who wanted to be a doctor but her father refused; the battered Violet Miller (Anne-Marie Duff, a touching portrayal and fantastic performance); and Emily Wilding Davison (Natalie Press), showing the dogged, unflinching dedication to the cause for which she is so well-known. 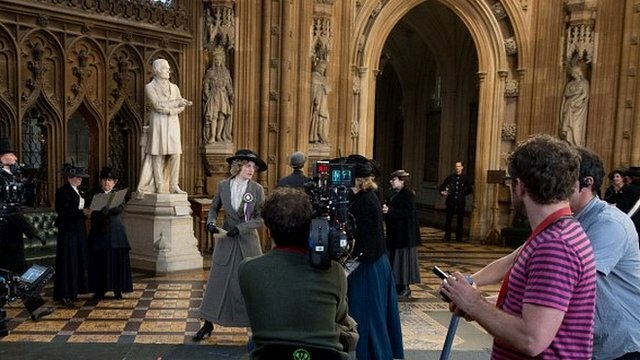 The star of the show, in the film as in real life, is Emmeline Pankhurst (Meryl Streep) in a brief but exhilarating cameo which serves to inspire the viewer just as it inspires the watching Maud. Some suffrage historians may be disappointed to find chunks of the broader suffrage story omitted. The film acknowledges ‘fifty years of peaceful campaigning’ prior to militancy, but we see nothing of the continuing campaigns of Millicent Fawcett and the NUWSS, or indeed any other of the many suffrage organisations apart from the WSPU. Apart from excursions to the Derby and Lloyd George’s summer house, the activity is very London based with none of the regional militancy shown or any allusion to national campaigns such as the suffrage pilgrimage. There is no mention of Christabel, and more seriously given the East End setting of much of the action, only a passing mention of Sylvia and the splits that took place within the WSPU leadership. The role played by Parliament is portrayed fairly simplistically, without reference for example to the MPs who were sympathetic to their cause such as Keir Hardie. But to criticise the film on these grounds is to miss its premise. This is not a documentary about the suffrage movement, or even a history of the WSPU. It is Maud’s story, and Maud stands for everywoman. The occasional lack of nuance reflects Maud’s own perspective, her understanding of her life and reasons for being a suffragette; that life was not fair for women, and Lloyd George and Parliament had betrayed her. I came out of the film to find my fellow viewers exclaiming about how shocking it all was, how recent it was, and how little they had known about the suffrage campaign before. We are gearing up here in Parliament to commemorate 100 years of the vote for some women and all men in 2018 and clearly much remains to be done in order to help people understand the significance of this. I very much hope that ‘Suffragette’ will be widely seen by people everywhere, especially young women, and help bring the story of women and the vote into the broader public consciousness. ‘Suffragette’ is on general release from 12 October 2015. Parliament is celebrating the launch of ‘Suffragette’ with a ‘Suffragette Season’ of tours, talks and other events. I loved the movie but I was not impressed with the list of countries showing when women got the vote. It left out Canada! Shame. It isn’t like the British don’t know who we are and when we got the vote.